Control and Readout of all modern High-Speed Video Digital Cameras. FalCon ImagerControl offers exactly the power you need for your test objects and crash systems. From a small test bench controlled by PC to a large system with a large number of auxiliary computers. Readout and processing times were still tolerable, having an imager resolution of 512*384 pixels. However this takes about 6 times longer using the new high-resolution cameras. For example, if you have needed 6 minutes per view until now, it took 1 hour using 10 cameras. 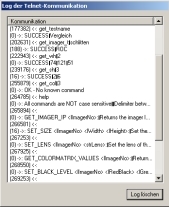 The same procedure will require 6 hours using the new cameras! We have taken measures to respond to this situation. What could be more obvious than sharing the task to several computers? Don’t worry, you don’t have to run from one screen to another. As before, you will need only one control computer. The rest takes place invisibly to you: You will just be surprised that processing could be that fast. A load balancing process comes into play, that considers the performance capacity of the auxiliary computers, the image size and the desired readout interval. And if you on the road with your laptop computer and no auxiliary computers are available, the laptop does all the work, and you don’t have to reconfigure anything. The software that grows to meet your demands! and also saves time on single-CPU systems. The integrated data viewer lets you examine the data immediately after the download. Optionally an uncompressed film sequence will be created with rapid image optimization only. While you are viewing this QuickLook sequence, the final and definitive AVI is being created in the background. Distortion correction may be performed immediately. 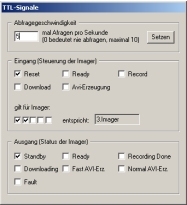 Auto download starts automatically after read initiation and AVI generation. Cameras from AOS, HS Vision, Microtron, NAC, PCO, Photron, Olympus, Redlake/IDT/Kodak, Vision Research and Weinberger. Unrestricted mixed-mode operation is possible without losing the features of a given manufacturer. Expandable: If you get a new camera, why not get an additional auxiliary computer to go with it? If you do, the overall processing time will stay the same. Remote control via PLC is possible. Remote control can be controlled by Telnet. The same is true of test and camera definition. The status of cameras is also available as TTL signals.